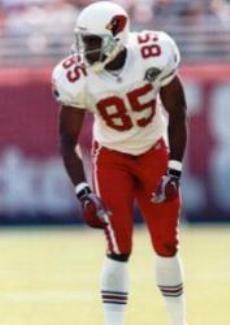 The Tampa Bay Buccaneers were 4-0 and looking to match the best start in franchise history as they hosted the Arizona Cardinals on September 28, 1997. The team that had been a perennial doormat since last posting a winning record during the strike-shortened 1982 season was beginning to come together in its second year under Head Coach Tony Dungy. The defense, featuring DT Warren Sapp, CB Donnie Abraham, and linebackers Derrick Brooks and Hardy Nickerson, was the key to the team’s improvement, while the offense was benefiting from the play of rookies RB Warrick Dunn and WR Reidel Anthony, second-year FB Mike Alstott, and much-improved fourth-year QB Trent Dilfer (pictured above). The Cardinals, under Head Coach Vince Tobin, were 1-2 and coming off a bye week. They had hurt themselves with fumbles in their previous losses to the Bengals and Redskins, and all three of their contests had been close. Arizona had fine wide receivers in Rob Moore and Frank Sanders, but QB Kent Graham was no better than average and, while FB Larry Centers was an outstanding receiver out of the backfield, the running game was not strong. The defensive line, anchored by DT Eric Swann, was tough and CB Aeneas Williams was an established star. There were 53,804 fans in attendance at Houlihan’s Stadium. The teams traded punts to start the game. Arizona’s second possession stalled and Jeff Feagles was again called on to punt with the line of scrimmage at his 40. However, the kick was blocked and recovered by LB Alshermond Singleton at the Arizona 28, and he took it the rest of the way for a touchdown. Michael Husted missed the extra point attempt and the score remained 6-0 in favor of the Buccaneers. The teams again traded punts as the Buccaneers were unable to get anything going on offense and the Cards were little better. They had the ball as the first quarter ended and, on the first play of the second quarter, faced a fourth-and-one situation at their own 41. Lining up for an apparent punt, LB Ronald McKinnon took the short snap and ran three yards for a first down. Kent Graham completed two passes for 16 yards but the drive stalled at the Tampa Bay 37. Once again the Cards attempted trickery as they lined up for a field goal try but then shifted to go for a quick running play instead. Eric Swann took the snap but fumbled and DE Marcus Jones recovered for the Bucs. It didn’t appear to be any more promising for Tampa Bay’s offense when the first play had to be aborted as Trent Dilfer fumbled and, while Warrick Dunn recovered, it was at a cost of ten yards. Two more plays had the Buccaneers facing fourth-and-16 and having to kick the ball away, but now it was their turn for a fake and punter Tommy Barnhardt completed a pass to safety Tony Bouie for a 25-yard gain. The offense came alive and Dilfer completed three passes, interspersed with runs by Dunn and Mike Alstott, with the third completion going to Reidel Anthony for an eight-yard touchdown. 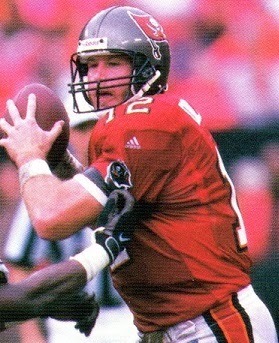 The Bucs tried for two points, but Alstott’s run up the middle was stopped short. Still, the home team held a 12-0 lead. The Cards responded by going 80 yards in eight plays. They converted two third downs, first when Graham threw to Rob Moore (pictured at left) for 28 yards in a third-and-seven situation and then to WR Anthony Edwards for six yards on a third-and-five play to the Tampa Bay 21. On the next play, and following the two-minute warning, Graham connected with Moore for a TD. Kevin Butler added the extra point and the score was 12-7 at the half. The Bucs went three-and-out to start the third quarter and Arizona again put points on the board. Following a holding penalty that backed them up to their 12, the Cards picked up 41 yards on a Graham-to-Moore pass play. A third-and-nine pass to Edwards gained 10 yards to the Tampa Bay 36 and Graham then threw to WR Kevin Williams for another 12 yards. The 10-play, 61-yard series finally ended with Butler kicking a 37-yard field goal that narrowed Tampa Bay’s lead to 12-10. Once more the teams traded punts but, with less than two minutes remaining in the period, the Cardinals got a big play on defense as Aeneas Williams intercepted a Dilfer pass and returned it 42 yards for a touchdown. They added two points on a Graham pass to Frank Sanders and the visitors were in front by 18-12 heading into the fourth quarter. The Bucs had a short series on offense followed by Arizona starting off with good field position at midfield following a 17-yard punt return by Kevin Williams. A pass to Moore gained 22 yards and carries by running backs LeShon Johnson and Leeland McElroy picked up 12 more. But Graham was sacked for a 10-yard loss and the drive stalled at the 25 from where Butler was wide on a 43-yard field goal attempt. The Bucs again went three-and-out on the next series but, after Barnhardt’s 57-yard punt pinned the Cardinals back at their five, the defense came through with a big play when SS John Lynch picked off an overthrown Graham pass at the Arizona 35. Four plays later, and facing fourth-and-six, Dilfer completed a pass to WR Karl Williams for a 31-yard touchdown. Husted’s key extra point put Tampa Bay back in front by a point. With less than five minutes remaining, Graham went to the air often but the Cards were unable to get out of their end of the field and had to punt. The Buccaneers, playing conservative, ran three plays and punted with Barnhardt’s booming kick going 57 yards and putting the visitors back at their 20 with 46 seconds remaining on the clock. Graham completed three passes, the big one to Sanders for a 37-yard gain to the Tampa Bay 29, but the game ended with Butler missing a 47-yard field goal attempt. The Buccaneers came away with a hard-fought 19-18 win. Tampa Bay came out on top despite low offensive output. The Cards dominated in total yards (364 to 167) and first downs (23 to 6). But the Buccaneers registered six sacks, to three by Arizona, and the Cardinals turned the ball over three times, to one by Tampa Bay. The Bucs also benefited from touchdowns by the special teams and defense. Trent Dilfer completed 12 of 24 passes for 110 yards, but two of them were good for touchdowns as opposed to one interception. Reidel Anthony had 5 catches for 49 yards and a TD. Warrick Dunn and Mike Alstott were held to 27 yards apiece, on 10 and 8 carries, respectively. However, Tommy Barnhardt (pictured at right) had an outstanding game, averaging 49.4 yards on eight punts, with two stopping inside the five yard line and had the pass completion for 25 yards on the fake. DT Brad Culpepper accounted for three sacks. 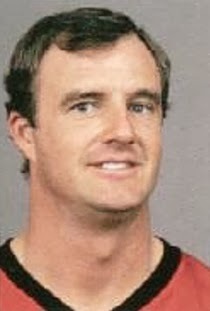 For the Cardinals, Kent Graham went to the air a season-high 52 times and was successful on 31 for 339 yards and a TD, but also had two intercepted with one of them directly resulting in a Tampa Bay score. Rob Moore caught 8 of those passes for 147 yards and a touchdown while FB Larry Centers also had 8 receptions for 58 yards in addition to his four carries for four yards. Leeland McElroy ran for 40 yards on 13 attempts. After matching the 5-0 start of the 1979 team, the Buccaneers lost the next three games but came back to finish at 10-6 and second in the NFC Central. Qualifying for a Wild Card playoff spot, they beat Detroit in the first round but lost to the division-champion Packers in the Divisional round. Arizona continued to struggle, ending up at the bottom of the NFC East with a 4-12 record. Trent Dilfer went to the Pro Bowl after passing for 2555 yards and 21 touchdowns with just 11 interceptions. Warrick Dunn (1440 yards from scrimmage) and Mike Alstott (665 rushing yards) were selected as well. Tommy Barnhardt averaged 45.0 yards on his 29 punts before a broken collar bone in the sixth game cost him the remainder of the season. Kent Graham also went down with an injury and gave way to rookie QB Jake Plummer. In eight games, Graham completed just 52 percent of his passes for 1408 yards and four TDs with five intercepted. Rob Moore continued to excel and was a consensus first-team All-NFL as well as Pro Bowl selection as he caught 97 passes for a league-leading 1584 yards and eight touchdowns.